Interactive Core Vocabulary Stories target core words using a core vocabular communication board. 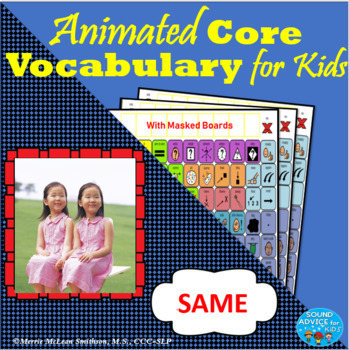 (If you don't have core vocabulary boards, you can find the masked boards I use at: https://www.teacherspayteachers.com/Store/Sound-Advice-For-Kids. The purpose of Interactive Core Vocabulary Stories is to help children learn the meaning of a targeted word while teaching them where the icon is located on a communication board. These stories were designed to be used during large group instruction and presented on an Interactive White Board; however, I also use them while working with children individually. I them share them with parents so their children can practice using the board at home. The target word is used on each page, giving students plenty of opportunities to see how the word is used, watch as an adult models the word and/or point to the word on his/her own board, on a classroom white board or on a computer touch screen. I love using a Core Vocabulary approach because children are taught words that are useful in almost every setting, activity or circumstance and with all communication partners! The words used are powerful and allow children to express themselves in a few words at first, and eventually in simple sentences. My Interactive Core Vocabulary Stories make it fun to practice these skills! Everything's the SAME is about twin girls who always want the same things: the same food, the same snacks, the same presents, etc. On the first page of Everything's the SAME, read the text and help your child/student point to the icon for “same.” If they can use a mouse, touchscreen or interactive white board, let them use it to select the correct picture. If not, let them point to the icon while you select it. If it’s correct, the picture will move toward the twin girls. If it’s incorrect, nothing will happen. On the next page, you will see a digital version of a core vocabulary board. The correct word is highlighted in red. Start by selecting “same” in the right-side margin. When it is selected, it will move to the correct position on the board. Select it again and it will move off the screen. Encourage your students to point to the target word on their own board after seeing it on the computer screen. For more student involvement, take turns asking different students to "activate" the word on the interactive white board. This product contains two versions: a 50-icon board and a 77-icon board. Each version presents the same story but with different communication boards. You can choose which board you want to use. The icons are masked, which means that words that are not used on a particular board are hidden. They are "unmasked" when boards with more icons are selected. This keeps each icon in the same place as more icons are added to larger boards. (The 20-icon and 30-icon boards are not included in this story because the word "same" is masked on these boards.) 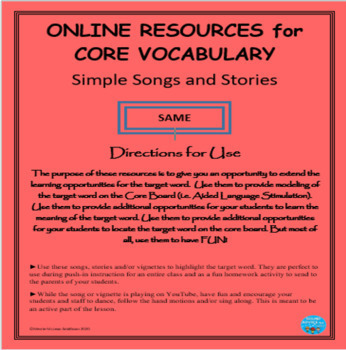 Interactive Core Vocabulary Stories help students practice pointing to the target word over and over to reinforce motor memory in a fun and motivating way. Providing lots of repetition to learn where the target word is located will develop students’ motor memory. This in turn will increase the speed in which your student/child can access the word when needed. I've used these stories in self-contained, functional life skills and inclusive classrooms. I typically use them during circle time activities when I'm introducing the target word to the entire class. When I'm not in the classroom, the special education or regular education teacher use them to reinforce what I've taught. The more familiar the students are with the story, the more they tend to participate! Typical peers enjoy these stories as much as the students with special needs, especially when they get to “act as the teacher” and model the word for everyone else. PLEASE PROVIDE FEEDBACK ON THIS PRODUCT! You will earn points in the TPT store. A win-win for everyone! Go to your accounts page and click on Purchases. Select this product and tell me what you think! Version 1 uses a masked core vocabulary board with 50 icons. 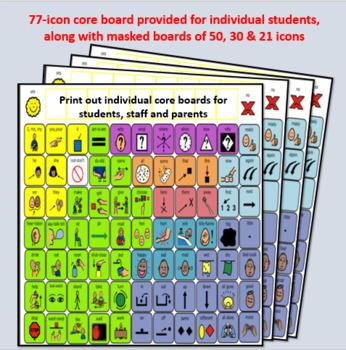 Version 2 uses a masked core vocabulary board with 77 icons.